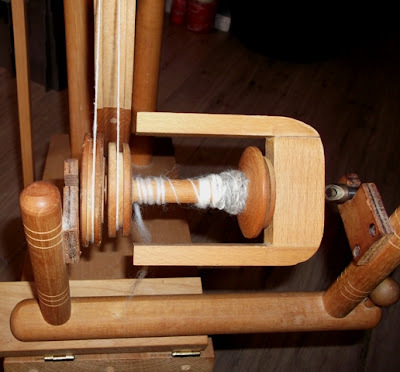 Well I haven't done a lot of spinning in the last month. Easter holidays in April meant I was out and about with my daughter enjoying the school holidays and since returning to school other things have taken priority. Poor spinning wheels, that will change in the coming weeks hopefully. For the last week or more we have not been well in the household too - ear and throat infections and colds, but we are all on the mend. Tiredness prevails though, so my concentration hasn't been so good. Knitted a circle on this side with some handspun Dorset Horn sourced locally and sewed it over the edges of the wooden ring. 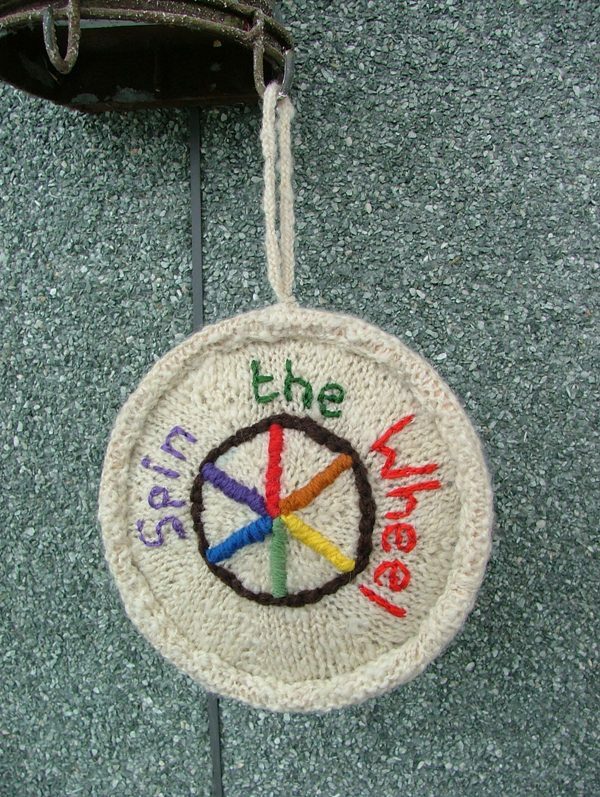 Then with some pure wool tapestry wools I created a wheel to signify the spinning wheel and did the spokes in different colours, like a colour wheel. I was very pleased with how it came out but felt it needed something else. I wanted to embroider a quote on there but couldn't find the perfect quote that was short enough to fit so I embroidered Spin the Wheel instead. The reverse side is needle felted with British wools. A little sheep in the field with lovely blue sky and wispy clouds. 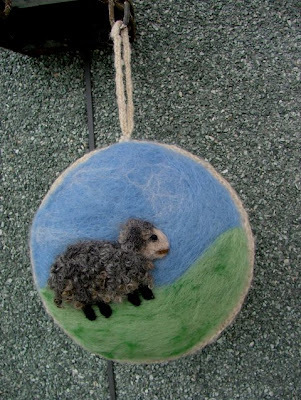 The sheep's coat is some lovely Gotland curls. I have attached this to the knitted edging of the ring using the felting needles, and added a bit of wool padding in the middle. I added a loop of Lucet cord made with the Dorset Horn handspun too. In other news I have also acquired another spinning wheel. I know, I really didn't need another one but sometimes things just fall into place. I saw this wheel after the Easter holidays in my local charity shop, not your usual items in this shop and I had to look twice to see if it really was what I was seeing. In need of attention was written on the label, and yes it does need a little attention and a price of £20. I gave it a good look, and turned and left the shop! Feeling it unnecessary and not knowing what my husband would say if I took it home, I walked away. 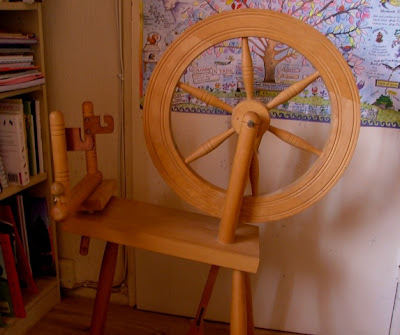 But this wheel was on my mind from then, and what ifs came to mind - I could take it to Guild, or find another avenue to pass it onto another spinner. My worst nightmare for it was that it would end up in the skip at the rear of the shop, or worse (whispers) firewood! 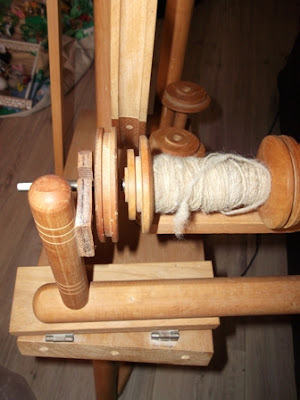 I returned to the shop the next day to have a deeper look, turned the wheel which moved beautifully, treadled lovely too, other bits just needed putting together to get the mother of all in place and it needed re-aligning too. 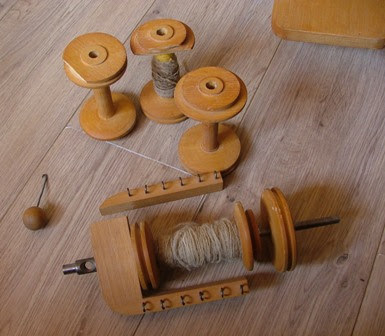 A couple of bobbins are damaged but replaceable. And now it was down to £10! I know that the next step for the shop would have been in the skip. I still wasn't sure but life sometimes has other ideas. The wheel was reserved for me to pick up and with the help of a lovely friend I picked it up the next morning. I sought help from ravelry, both before to talk me out of buying it (in case it was an ornament, or craftsman made and not working - which I thought it may be), and then after with photos. I was delighted to find that it was actually a known maker - a Westbury wheel, built nearby in Wiltshire. So a rescued lovely little wheel has been welcomed into our home. I'll let you know how she settles in. With not being very well, I hadn't done much to fix the alignment until this week - so it is still a work in progress, but she will be up and running soon. Just needs some tweaking now - the treadle bar is sticking occasionally so I need to look at that. Once I can see how she spins I am thinking that this will be a gift to my daughter, who would absolutely love her own wheel - something she has talked about in the past ... "when I have my own wheel ...". She hasn't seen it yet, it has been hidden away much to my husbands amusement when it was living in the downstairs toilet room for the first day. It's moved now and feeling much happier. I am also knitting having finally settled on a pattern for the zwartble x grey yarn spun last year. I have always wanted to get this knitted into something for me, and unsurprisingly have returned to the original pattern I had in mind, despite being tempted by other patterns along the way. 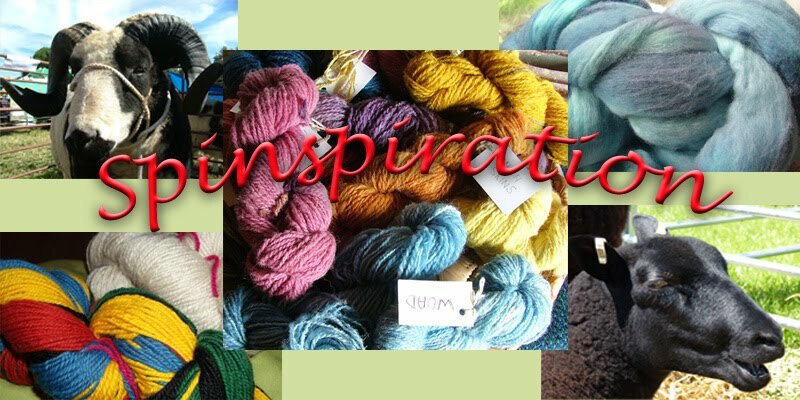 More on this next month - I have knitted about 4 inches so far so not a lot to see yet. Looking forward to seeing other Woolly Wednesday posts, come and share your spinning, felting, knitting, crochet, weaving ... or anything else I may have missed out.